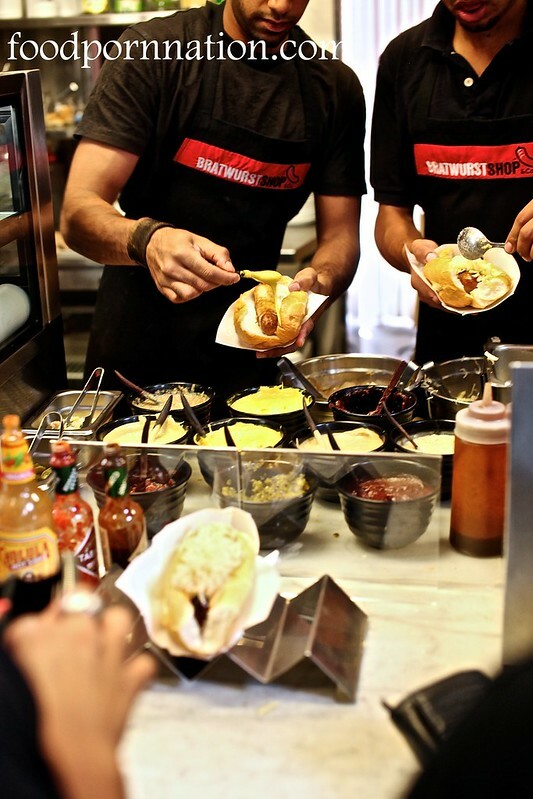 For any food lover, a visit to Melbourne always deserves a pilgrimage to the mecca for foodies – Queen Victoria Markets. Almost equals to the amusement parks lovers coming for the theme parks to visit in Melbourne. Deep down it is like any market, with stall owners bellowing out their best price, urging you to buy, buy, buy! But unlike no other, everything is all within reach, bringing together a massive hub of fresh meat, seafood, fruit, veges, delicatessens and desserts. It is so delicious to look at, the sight of it rarely gets old. Like all my visits to Melbourne, I always come back to the Bratwurst Shop & Co. Even Anthony Bourdain knows it. It is that good. With the sure fire signs of a popular eatery. 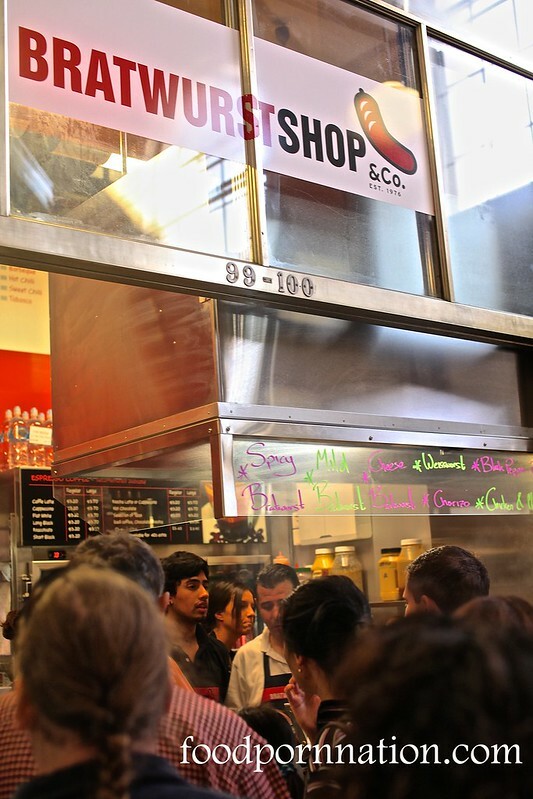 The human frenzy swarming in front of the counter is something to manoeuvre with. Get your pointy elbows out, move with haste and make way to the front. There is a real sense of urgency and everything is rushed. You’re in and you’re out. Your options include: Spicy Bratwurst, Mild Bratwurst, Cheese Bratwurst, Weisswurst, Chorizo, Black Pepper Pork and Chicken & Mushroom. 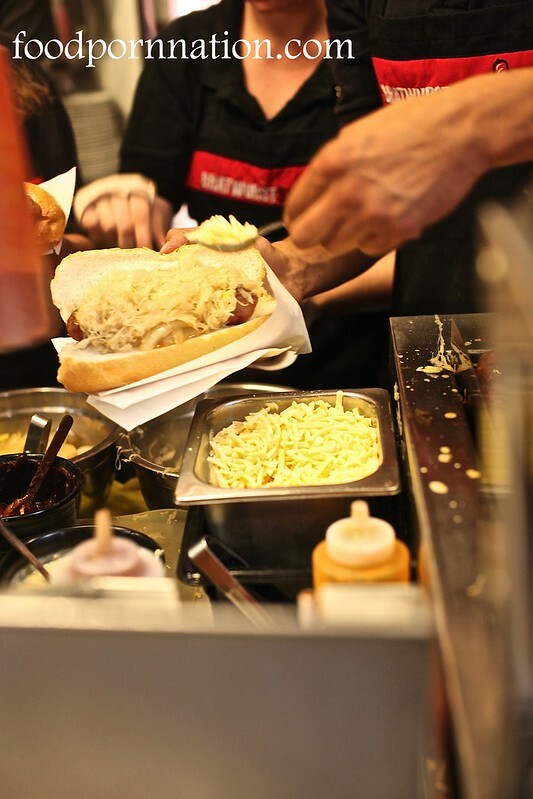 I ordered the cheese bratwurst and piled it with mustard, onions, sauerkraut and cheese. This required a decent amount of compressing to fit it in my mouth. So far it is my favourite bratwurst to date. Loving the snap of the wurst with the nuggets of soft cheese concealed with each bite. 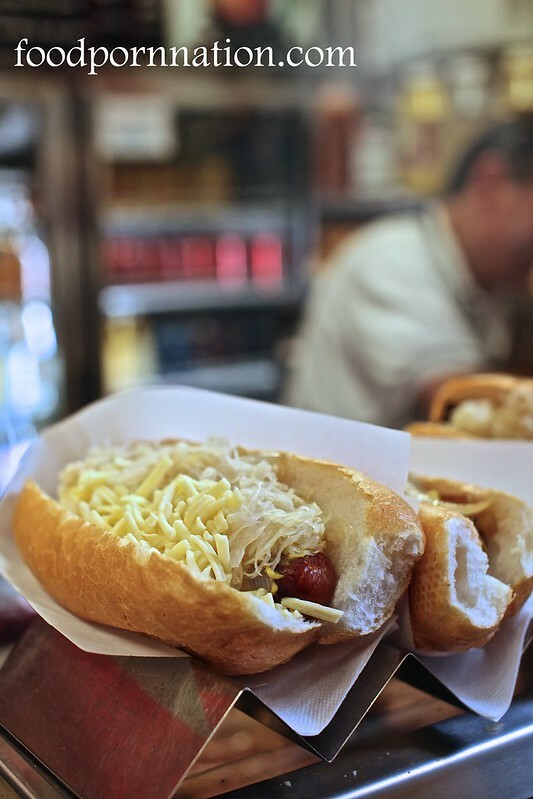 It is the perfect combo – there’s the crunch of bread, the tang of sauerkraut, onions and the creaminess of the cheese. 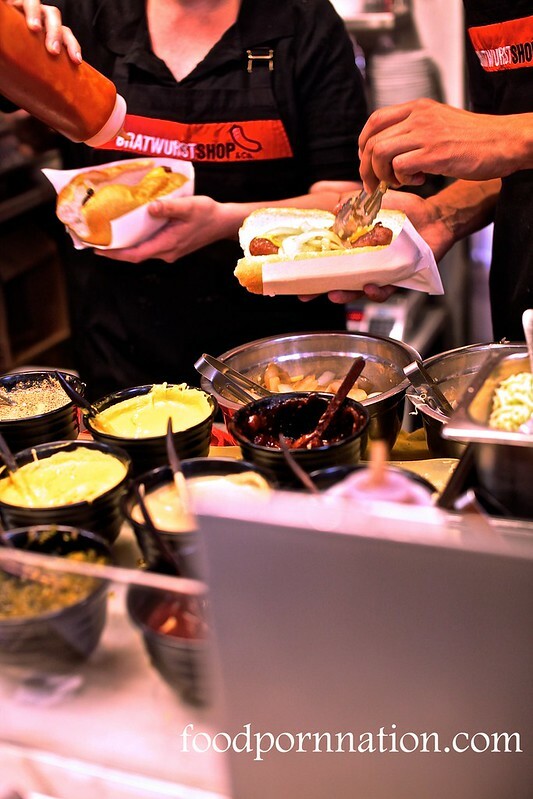 Welcome to Bratwurst Shop & Co and get your wurst on. For all the times I’ve been to Melbs and even to the Queen Vic Market I never tried this place. Any guesses what I’ll be doing next time I’m there? Ohh~~ A new place to try out when in Melbourne! !